1. To all of you who were praying, the baby got his miracle. My entire family is completely amazed and thankful for how the situation turned out. So thank you for praying. Thank you for caring. Thank you. 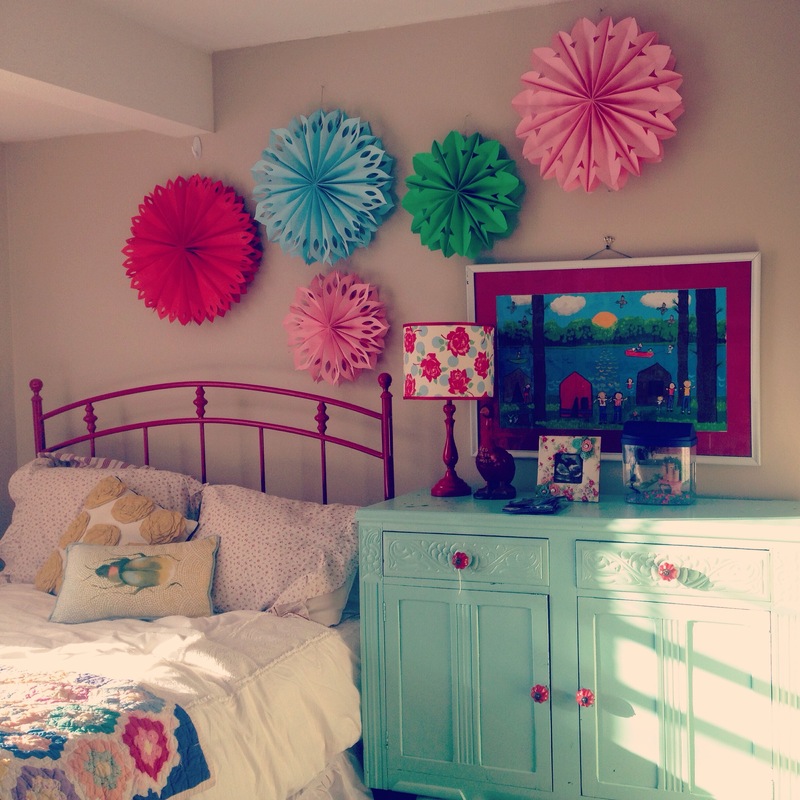 (and also to prove to Mother Nature that it’s spring and she should get a move on already) I hung paper flowers in Jane’s room. She was thrilled. In fact she screamed, “Paper flowers on my wall sooooo beautiful!” I’ve never ever gotten so much mileage out of old party decorations before. 3. I’m really excited to be part of the 2015 Listen to Your Mother cast here in Little Rock. And nervous. Speaking in public isn’t totally my thing. My voice sometimes gets low and ends up sounding like Kathleen Turner after she’s smoked a pack. I’m already practicing keeping it at a normal octave. But then I raised it too high and Jane asked, “Are you a mouse on Cinderella?” And then I know it’s time to pour myself a big root beer and eat a couple of M&M’s and watch House of Cards. Please make plans to join us. It will be a lot of fun. I can’t promise I won’t have mouse voice. 4. I’m going back through my old blog posts on Mabel’s House and republishing them as I have time. So you may be seeing them in your old feeds, and will probably see a lot more as I go through them. I archived everything, which almost made it feel like six years of my life and writing vanished, and that made me sad. I missed being able to go back and see Jane’s chubby face and read all the things she did when she was a baby. And I also just missed that blogging history. So I’m working on that, don’t be alarmed at your blog feeds. The internets have not lost their minds. Well here’s one thing that’s true, if you move to NYC, you won’t struggle to find work. Because you could easily be an interior designer or stager, even a designer for retail at stores like Anthrologie. Your eye for design is FAB lady!!! Aw… you flatterer you. And no matter what happens, never allow me to work in Anthropologie. Knock me down at the door and drag me away kicking and screaming. I would end up in debt to them for more than my paychecks, and then their Anthropologie-strong-arm-men would come find me and threaten to break my thumbs if I didn’t square up. Hope to see you soon friend! Let’s just open our own Anthropologie-like store. Wait, that wouldn’t be better. But ok, you have yourself a deal. I will keep you from working there. And I will see you sooner than later. I hope. Good news about the baby!! Looking forward to old blog posts. I’ve followed your blog for many years and have really enjoyed it. i’ll be right there with you on the stage with my shaky voice and fire engine red ears. Great news about the baby! I love the paper flowers – they’re so cheery & bright! After a long snowy winter here I’m ready for some color & flowers. I believe in prayer and miracles. I prayed for this baby who I don’t even know their name, but am grateful for sweet miracles because of a loving Heavenly Father who hears and answers prayers. When I had ovarian cancer I had so many people who I didn’t know pray for me and have seen my own miracle because of the prayers of strangers who I consider friends. I love following your blog. I think it would great fun to have lunch with you if I ever find my way to AK! Love those paper flowers!!! And that sweet little room. I am SO excited to hear you are re-publishing from your old blog! As a stalker….I mean FAN…I have missed some of the content such as your decorating and of course Jane-stories and just your insight. I was elated when i saw them start to flood in and have to admit I “binge read”…thank you! I do believe spring might be here and join in with in declaring it to be so 🙂 Hoping you have a fantastical weekend!